I posted less this year than during any year since I began this blog in 2007. Unsurprisingly, traffic also dropped, but it mainly affected the average -- the numbers for the most-viewed posts were not much lower than normal. And I'm pleased that several of the most-viewed posts are also among those I think are the best. 16. This Time for Sure: A Kinder, Gentler Bigotry. The local library just got a copy of the book I mentioned in this post. I expect I'll write more about it when I've read it. But since I wrote this I've noticed quite a few more books which take the position I criticized here -- a kinder, gentler bigotry. It's only a public-relations stance, nothing new. 15. Surely, Comrades, You Do Not Wish Bush Back? On the doublethink that was so widespread during the presidential campaign. In other words, dog bites man; nothing to see here, folks, just a reminder of what was going on. 14. First They Came for the Politically Correct Conor Friedersdorf of The Atlantic likes to seek out the human side of American bigotry, mostly with regard to antigay sentiments but sometimes, as here, the Trump supporter. It's not a bad idea in principle, but his results are almost always embarrassing. In the piece I wrote about here, it was a Trump supporter who projected his own antagonism to people with different politics onto them, and constructed a fantasy about the hatred they felt for him out of his own Political Correctness. It might not be totally fantasized, since liberals are as a class no more rational than he is. 13. Racism As We Know It Today This one probably got more views because it appeared in Vagabond Scholar's 2016 Jon Swift Roundup for bloggers, but I'm glad of that because I think it's a good piece. It's not really news that liberal Democrats are willing to dismantle the New Deal and the other social programs it inspired, but it's been educational to watch how rabidly irrational they've become since Trump's victory in November. It connects to this earlier piece about the same stereotypes as they were used to support white racism in the 1960s. 11. Every Knee Shall Bend and Every Tongue Confess Trump Derangement Syndrome kicked in among liberals -- even among those who, like the person I described in this post, would consider themselves farther left than liberals -- almost as soon as he declared his candidacy. We can see how well it worked. 10. Thanks, Obama! Almost everybody, his fans and his enemies alike, seems to think that Barack Obama is reluctant to resort to warfare. This brief post points to the dissonance between Obama fans' vaunted concern about suffering children in Syria and their utter lack of concern about suffering children in Yemen, where American weapons are killing them, with Obama's overt assistance. 9. It's All Fun Until Somebody Loses an Eye On the Obama administration's continuing foreign-policy feckless aggression. 8. Neo-pro, Neo-con On foreign-policy nostalgia (amnesia turned around) among pundits and political elites across the political spectrum; with a brief account of Eisenhower's disastrous (for Indonesians) interference in Indonesian politics during the 1950s. Let no one tell you that only the Chinese are obsessed with "face"; Americans just call it by different (though related) names, like "optics." 7. Clanging Symbols On pro footballer Colin Kaepernick's protest against the national anthem, and the confusion about it fostered not only among professional sports pundits but by President Obama. 6. Unraveling Offense One of the posts I'm proudest of this year, finished after much dithering and procrastination as always. It follows a thought I've often had, that being offended is not something that can be escaped or suppressed, but an inevitable part of human life. It's inherent in the social movements that have helped produce so much change in our society. Instead of fearing either to give or receive it, we should concentrate on how to deal with it constructively. Never happen, of course. 5. Wait, What? Fairly early in the 2016 primaries, as Trump began to accumulate victories, the corporate media began wondering How This Could Be. The Guardian, a putatively progressive British newspaper with a following among American liberals, did a big article on supposedly "secret" Trump voters (see 14 above for another example), which I discussed in this post. 4. Mnyeh, Typical On Israel and stereotyping. 3. When Clown Suits Are Outlawed... Just a one-liner, inspired by the brief rash of panic over nasty clown sightings in middle America, but apparently a lot of people liked it. 2. Moderation. Trump Derangement Syndrome wasn't universal this year. Tariq Ali, whom I quoted in this post, didn't succumb to it, but he was one of the outliers. 1. Reading Reed. Early in the year, as celebrities began moving like lemmings to another, higher plane, I wrote this post about the rumors of the late Lou Reed's bisexuality. (Following up this post on the late David Bowie's bisexuality.) Even in the Age of the Internet, we know less than we might have thought, but it is easier to examine and discredit what Everybody Knows than ever before. The trouble is that not all that many people seem to care. One other thing Everybody Knows is that the Internet has made it harder to know what's true and what isn't; I believe the opposite is true, that in reality it's easier than ever to expose error and falsehood, but "knowing" that you can't is evidently comforting to many people. Though they pretend to lament our "post-truth" culture, they are quite comfortable in it. It always baffles me. When people make up religions, afterlives, and gods, they could imagine anything, and certainly better ones than existing religions offer. Instead their substitutes tend to be worse. This person basically imagines David Bowie's afterlife as an ectoplasmic Studio 54, where only the truly cool people get past the bouncer. It's kind of like the Rapture. If you're still here, you have been weighed in the divine balance and found wanting. That includes Miss Texas 1967, who like the rest of us losers will get to experience the Tribulation to come, with all its horrors. 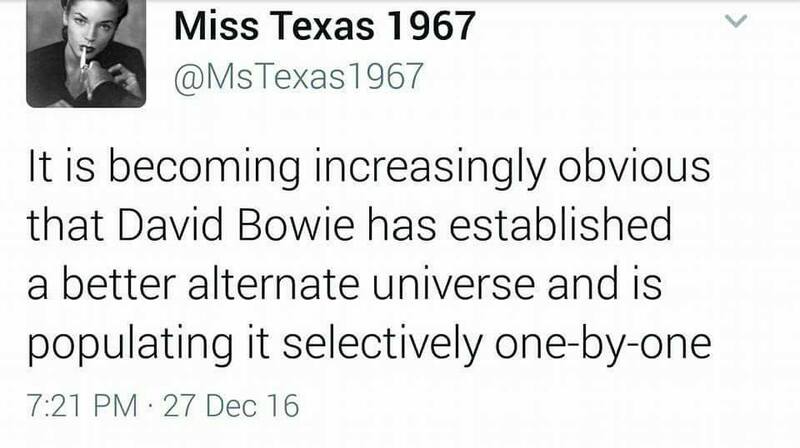 Does she (or the people who've shared this tweet) really find it comforting to imagine Bowie and, e.g., Carrie Fisher partying for eternity, with an inexhaustible supply of Ecstasy, coke, and cocktails, while she hovers in the outer darkness, with only a dwindling hope that The Thin White Duke will take her before midnight on December 31? 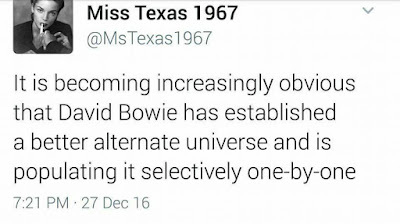 I wish I could take seriously the possibility that she meant her fantasy ironically, snarkily, satirically, but the person who shared it has been dead serious in cursing 2016 and all its works, and I doubt Miss Texas 1967 is any different. As if things weren't frustrating, infuriating, and depressing enough already, many people chose to spend the past year throwing tantrums every time a celebrity died. I've been wondering whether more famous people have died in 2016 than usual, or entertainment media have made sure that we hear about them, but it doesn't matter. Someone (a friend of a friend, not anyone I know personally) posted on Facebook yesterday that 96-year-old Richard Adams, best known as the author of Watership Down, had moved "to a higher plane," and then cursed the year 2016 for killing off so many sublime artistes. I decided to chicken out, and not comment under the post that inspired it. I decided not to rain on someone's funeral, even though the poster didn't know Adams personally. I also didn't feel like taking the spiritual hate that such people indulge to show how awakened they are. (Or "woke"? WTF is that about, anyway?) This time. There will be other times. Choose your battles. I'll just post it here as a more general reflection. I always wonder when people use jargon like "leaving this plane" as a euphemism for death. If we don't really die, if we really go on to another, possibly better place, what is there to be upset about -- except for those of us who are still stuck here? It's one reason why I doubt whether people who claim to do so really believe in personal or other immortality. C. S. Lewis once argued that everybody believes in immortality, so it must be true -- something like that, I don't have the quotation to hand. I immediately thought that it cut the other way: those who claim to believe that death is not The End don't really seem to mean it, they still see death as something fearful and final. Even those who claim to believe that Heaven is their destination are, for some reason, less than eager to cross that lonesome river. Very well, but they don't want anyone else to die either, no matter how aged, infirm, and suffering they may be. Some years ago I audited a summer course in the philosophy of religion. Only two or three other people had signed up for it, so the professor welcomed another participant. The student I remember best was a young woman who seemed determined not to learn anything from the course, but to get her spiritual preconceptions confirmed; we had some lively exchanges. I learned something from her, though not what she probably expected. I noticed that she alternated between seeing death as a sign of spiritual failure (rather like the apostle Paul) on the one hand, and as a sign of spiritual advancement on the other (like the person who thought Richard Adams had left this plane, but was still really pissed about it). I pointed this out to her, and she spluttered and thrashed around for a moment, but couldn't reconcile her contradictory views. I believe she said that it was both. That doesn't work. The class moved on to other topics. As Sappho so wisely wrote over 2000 years ago: We know death is an evil; otherwise, the gods would be mortal. I can say that, atheist though I be. But it's also inescapable. Everybody dies. We don't have to be happy about it, and I'm not, but it's annoying to see so many adults, their voices amplified in a chorus of panic, trying to deny human mortality. If you scream and stomp your feet and hold your breath till your face turns blue, will you live forever? Or as I did ask a couple of Facebook friends who anticipated that things would be better in 2017, did they mean that in 2017 nobody will have to die at all? One replied, saying that only really terrible people would die. The people he considered terrible, of course. Oh, my aching head. Once again, Batocchio has posted his annual Jon Swift Memorial Roundup, carrying on the good work of the late Al Weisel, alias Jon Swift. Bloggers choose their own favorite post of the year, and Batocchio posts them. I'm in there, of course, but so are a good many other writers you might not have heard of. Take a look and see what you think. It was always safe to predict that when a Republican became President, Democrats and Republicans would switch places again. Policies and actions that Democrats had denounced under Bush became not only acceptable but proof of Obama's greatness when he adopted them; now they will once more be proof of Republican evil. What does feel a little odd to me -- once again I find I'm less cynical and more naive than I thought -- is watching so many liberal Democrats adopt Tea-Party-style paranoid conspiracy theories and McCarthyite red-baiting at such a peak of intensity, acting exactly as they warned Trump supporters would act if their candidate wasn't elected. Since Election Day, Democratic stalwarts have exploded with rage at the white trash who voted for Trump, having honed their rhetoric while raging at their British counterparts who voted for Brexit a few months earlier. Some liberal and especially left writers have pointed out just how badly off the working class, white and black, is nowadays thanks to the economic policies embraced by both parties. Somewhere along the line the phrase "economic anxiety" caught on, and Democratic apologists jumped on it. See how selective quotation can skew a writer's intent? (Shirley Sherrod would empathize, I bet.) I think Ms. Mbakwe is mistaken here, though, because each group "is given the benefit of the doubt" by many Americans and "demonized" by others. She's also mistaken in assuming that recognizing the grievances of a group equals either giving them the benefit of the doubt or justifying their bad behavior. I recognize the grievances of elite Democrats, for instance, but I don't give them the benefit of the doubt or justify their bad behavior. Since the 60s, at least, Democrats have never been very interested in the white working poor, except as punching bags. (Republicans have mainly seen them as a hornets' nest of resentment they could exploit for votes, but they didn't care about their welfare any more than the Dems did.) Democratic politicians' preference for "middle class" rather than "working class" was no accident; Bernie Sanders broke with that pattern, and now that I think of it, I'm surprised that his supporters didn't seem to realize who he was talking about. It's especially ironic for Yes, You're Racist (henceforth YYR) to post Ms. Mbakwe's remarks, because he himself happily extends empathy to one group while demonizing the other. "A riot is the language of the unheard," he replied to a tweet by a presumably white apologist for racism a couple of months ago, though it's certain that he would never say such a thing about riots by whites, and this remark goes beyond "extending empathy" -- it sounds like an endorsement. But it's okay to be thoughtless if you're on the right side. Anyone who knows anything about the history of American racism knows that white elites have often used racism to divide working-class and poor whites from working-class and poor blacks. It's virtually a cliche. Contrary to Robert Reich's optimistic declaration in that 2014 post that the strategy was "starting to backfire," it worked very well for Donald Trump. So let's leave empathy out of it. (I haven't read Paul Bloom's Against Empathy: The Case for Rational Compassion [Ecco, 2016] yet -- should I?) It's a valuable human capacity, but it's not the only one we have. Just as Michael Neumann criticized "respect" (via), if empathy means not killing or starving people, fine -- but you shouldn't do those things even to people you don't empathize with. American liberals are perfectly willing, indeed happy, to kill and starve people they disapprove of (or even, as in the case of Middle Eastern civilians, people who are too far away to be noticed). It's easy to empathize with people who've been cast as worthily pitiful by a good propaganda campaign, as I've seen with the concern for Syrian children; and easy to ignore those who haven't: show liberals a picture of a starving Yemeni child, whose plight President Obama has worked hard to worsen, and they won't remember it five minutes later. In the case of the white working class and working poor, many white liberals have gone beyond merely switching off their empathy into explicit punitive fantasies. It has been pointed out that racism is too simple an explanation for Trump's election, that working class whites voted for Obama but not for Clinton, but leave that aside. It doesn't matter. Even if all those who voted for Trump or simply didn't betake themselves to the polls to vote for Clinton were racist, it remains true that bipartisan domestic policy of the past several decades has hurt working people of all colors and both sexes. Since both Republican and Democratic elites have continued their destructive policies while knowing full well the effect they had, they can't claim they were unaware of their effects or that they deeply cared (empathized?) with the people they were hurting; they just cared more about the wealthy, and they empathize deeply with them. Our society and our government owe to all citizens the resources to earn a living, to support themselves and their families, even if many of those citizens are bad people. Many of them are. I've noticed before how liberals tend to flounder when white racists justify racism by pointing out that poor black people often break the law, live improvidently, try to anesthetize themselves with drugs and alcohol, and engage in violence against each other. Of course, poor white people do exactly the same thing, and they serve the same function for white liberals. There's a heroin epidemic right now in the Midwest which affects whites no less than blacks, and the stereotypical meth user in liberal discourse was a poor white person; rather than stimulate empathy, this stereotype was used to justify contempt for poor whites, who were obviously just a bunch of toothless, cousin-marrying losers, not worth bothering about. Memes featuring obese, badly dressed white people shopping at Walmart are a staple of white liberal Facebook pages, and they were invoked on the Internet well before memes became a thing. Toothless, cousin-marrying losers need to be able to find jobs and support their families. They need a roof over their heads. They need health care to fix their bad teeth and good public schools to educate their children. To say so is not to minimize their racism or other unseemly traits, any more than good economic policy justifies poor blacks' frequent criminality and bad beliefs. Nor is it to recommend, as the New York Times did recently, that the Democratic Party should reach out to working class whites by pandering to their racism instead of ameliorating their economic plight. Middle class and wealthy whites also have bad beliefs and are frequently criminal, but they aren't held accountable as poor whites and blacks are. We have to distinguish between poor whites' racism and their economic and political rights, just as we do between poor blacks' misbehavior and their economic and political rights. Empathy doesn't entail uncritical approval, just as you can vote for a corrupt neoliberal as the lesser evil while criticizing her relentlessly. Martin Luther King Jr. knew this, as did black radicals of the late 1960s; if today's white liberals don't know it, and it seems they don't, then they are not part of the solution but part of the problem. It has already been largely forgotten that Trump's political success, like that of the Tea Party before him, signified a revolt against the Republican Party establishment. Everyone who mattered expected Jeb Bush or someone like him to be the GOP presidential nominee. Republican elites were as horrified by the trash who were supporting Trump as Democratic elites were. The corporate media tried hard to establish an equivalence (see item 5) between Trump's supporters and Bernie Sanders's, and that was correct in that both appealed to people who didn't want to vote for another entitled rich person who was comfortable with the current economic and political situation in the world. Discontent with the status quo is considered unforgivable by those who are satisfied with it. It looks like a safe bet that Trump will disappoint those who voted for him in the hope that he would break with economic business as usual, as he packs his Cabinet and administration with corporate hacks -- just as Obama did before him, and as Clinton would have done had she been elected. If that plays out as I expect, I'll feel Schadenfreude as much as any Democrat, but I'll also know that it means things are just going to keep getting worse. Who will come along in 2020 or 2024 to capitalize on people's disappointment with Trump? It looks like enough killjoys have been pointing out the US governments' fondness for interfering in other countries' elections, for overthrowing other countries' elected goverments and replacing them with brutal dictatorships, that some Democrats are starting to find it necessary to respond. What I've seen so far has pretty much been along the lines of "Two wrongs don't make a right" and "People who've done wrong things have the right to complain when wrong things are done to them." Sound enough principles, but these people are overlooking something important. The US government generally, and Hillary Clinton in particular, does not consider it wrong to interfere in other countries' elections -- quite the contrary. Therefore we aren't dealing with two wrongs here, if it turns out that Russia did intervene in the election; we're dealing with two rights, the prerogative of great powers. The same applies to the second retort: can people complain when someone does to them the same thing they consider right when they do it to others? What isn't acceptable is to change the rules when your own chickens come home to roost. Many Democrats declared during the election campaign that anyone who failed to support Clinton with the requisite degree of devotion and adulation, let alone anyone who criticized her in any way, was aiding Trump and would be responsible for the terrible things that would happen if he became President. They were not willing to accept responsibility for the terrible things that would happen if Clinton became President -- that would have nothing to do with them, they insisted (when they deigned to hear the argument at all), and besides Hillary wouldn't do anything terrrible, since she was a true progressive who would keep America great again! I've never seen Democratic loyalists of this stripe really object to US interference in other countries' elections or government anyway (except, sometimes, when the President is a Republican), so I can't take seriously their sudden discovery that it's a bad thing. They were at most silent, and more often celebratory, when the US and its proxies overthrew elected governments. So, like Clinton, they can't really claim that Russian interference in US elections would be a bad thing. (I'm obviously leaving aside the question whether Russian intervention took place, and if so whether it gave Trump the Electoral College victory; that too is open to doubt, but it's not my concern here.) Barack Obama, to whom these considerations also apply, has occasionally admitted that in the remote past the US has been less than saintly in its dealings with smaller, weaker states, but he never let this admission interfere with continuing the tradition. Of course this is just typical American exceptionalism: it's different when we do it, because we have good intentions. Some Further Thoughts on "Lesser Evils"
Another procrastinatory post, but it also fits in with the one I'm trying, slowly, to write. A few weeks ago I posted on Facebook that I'd voted for Bernie Sanders as "the lesser evil." This upset a friend who worked for Sanders in the primaries. He conceded that Sanders was flawed but he couldn't see him as evil. I pointed to Sanders's support for no-fly / no-buy (a no-due-process policy that would mainly target Muslims), his ambivalent criticism of Israel, his support for the Iran nuclear deal based on some odd assumptions about America's right to order other countries around. (In this position statement Sanders spends most of his time on a tirade about George W. Bush's invasion of Iraq, but never acknowledges that Iran didn't have and wasn't pursuing a nuclear weapons program in the first place. In general, supporters of the agreement from Obama on down have deliberately confused "nuclear program" and "nuclear weapons program.") I got bogged down in other things and didn't continue the conversation, but something occurred to me today. Perhaps, having clarified this in my mind, I'll return to the exchange with my friend. I want to ask my friend and all other Democrats, whether Sandernista or Clintonbot, what is the proper response when someone tells them that he or she intends to vote for their candidate -- but as the lesser evil. I think the answer is obvious. It should be something along the lines of "Thanks for your vote. Will you need a ride to the polls on election day?" It's revealing that, on the contrary, their first (and last, for that matter) impulse is to attack the prospective voter, as though his or her vote is not wanted unless it is offered in a spirit of total and unconditional adulation. A vague admission that the candidate is "flawed" may then be permitted, provided that no flaws are specified or acknowledged. It seems to me that a vote is a vote, but Democrats evidently don't agree. My friend was much less hostile than Clinton or Obama devotees, but that may be because no one had ever called Sanders "the lesser evil" around him before, and he wasn't ready to break out the vitriol yet. My original remarks on Facebook were partly satirical anyway, which I thought would be obvious to anyone who'd been conscious during the past election season. It now seems to me that anyone being asked for their vote should refer to the candidate in question as the lesser evil, and see what reaction they get. If you encounter resistance, you're dealing with a personality cultist who is unable to see their candidate clearly, and who is hoping to elect a messiah, not a politician. This is why there was a good deal of disappointment (exactly how much, I'm not sure) among his supporters when Sanders kept his promise to campaign for Clinton after she won the nomination. (My friend wasn't one of these, I should mention.) It's why Obamamaniacs were unable to hold his feet to the fire when he was elected and began breaking his promises, selling out his base -- though of course he'd begun doing that during the campaign, and met almost no resistance, so why not continue? If you can't vote for someone while being as critical of them as need be, but must attack all their critics -- even those who vote for them -- something is wrong; you're probably pushing a bad candidate, and the angrier the criticism makes you, the worse your candidate probably is. Let me procrastinate a bit on another post I'm in the middle of by writing this one. It all ties together in the end anyway. Nonetheless, we underestimate [the] Internet’s impact on literature and philosophy: ever since everyone has the power to say his personal opinion about everything, even when he is a total incompetent about the subject; ever since everyone can quote a writer without feeling the need to report the source and ever since everyone seems to not care at all about sources, believing in everything he sees on Internet, every quote has completely lost reliability. There's a fair amount of Occidental hyperbole in this paragraph: "everyone seems to not care at all about sources," etc. But everyone has always had the power to say his personal opinion about everything. Before literacy became widespread, anybody could stand outside and announce that he (less often she) was filled with the Holy Spirit and you'd better listen. Often people did. Often they didn't. There was always rumor, and folklore, and sources had a way of disappearing after a couple of iterations. You could never be sure who had said something, and the same sayings were attributed to different sages. After writing was invented, there was the problem of forgeries, or pseudepigrapha as they're more delicately known. Who composed the Homeric poems? No one knows, so it's convenient and not unreasonable to ascribe them to Homer. Other poems were ascribed to the same author, though probably they were not his. Works were written in the name of Plato and other philosophers. You'll find that many ancient works from the Greco-Roman world were written by Pseudo-guys. Before the Internet came along in my own lifetime, many rumors and legends circulated: that queers wore yellow (or was it green?) on Tuesdays (or was it Thursdays? ), for instance. That Franklin Delano Roosevelt was actually a Jew, who had syphilis not polio. At about the time I graduated from high school, the myth that Paul McCartney had died and been replaced by a lookalike began to circulate, and it persists to this day; even many people who don't believe it still think that the Beatles were responsible for the story and had put clues about it in their songs and on their album covers. Some of these canards circulated orally, others were mimeographed or printed cheaply on offset presses. It was often impossible to track such falsehoods to their source, and not many people cared much. If they liked what they heard, they believed it; if not, they scoffed. And although most people are acquainted with the concept of "urban legends," popularized by the folklorist Jan Harold Brunvand, they still readily believe them. The people who post lists of criteria for discerning fact from deception generally fail to observe them themselves. The Internet has increased the reach of ordinary people, and the speed with which information travels and spreads. But the difference is one of degree, not kind. True, anyone with Internet access can express his or her opinions, regardless of competence, but most that is posted on the Internet will never be seen by more than a few people. No one can predict when a given posting will go viral. Do people believe everything they see on the Internet? Of course not; that's more Occidental hyperbole. People believe what they want to believe, and ignore what they don't want to believe. So, for example, my Third Right-Wing Acquaintance boasted that since she couldn't tell who was telling the truth on the Internet, she just believed what she found congenial. Many other people do the same, but are less forthright about it. During my research I have contacted many bloggers, asking them where Camus should have written/said this or that; their answer was always the same: «check it on Google». Indeed, their reasoning was simple but tremendously naïve: if a quote is reported by so many people – millions of references in some cases – the author of this quote “must” be Albert Camus. I believe that it's much easier now, in the age of the Internet, to find out whether a given quotation is authentic or not. It helps that there are sites like Quote Investigator and Wikiquote, to say nothing of Fake Buddha Quotes itself, where people do a lot of the necessary detective work. But something else is going on here. Bodhipaksa remarks, "I paraphrase this attitude as 'It must be true. I read it on the internet.'" It's true, many people believe this, or act as if they do. But how different is it from saying, say, "It must be true, I read it in the Bible"? Or "I heard it on the news"? Much of the current concern about "fake news" is explicitly intended to recall people to the fold shepherded by traditional authority: print media, the three big television networks, government officials -- the right government officials, meaning those of one's favored party. Yet these authorities have discredited themselves again and again, with no accountability, and have never been particularly reliable. Who is competent to have an opinion? The general answer is: the same wise, credentialed, responsible commentators your parents trusted. But those people got us into the mess we're in now, and have no idea how to get us out of it except to proffer more of the same. In narrow domains, where comparatively little is at stake -- Camus studies, say -- credentialed authority can be relied on much of the time. It's fairly easy to tell whether a saying ascribed to Jesus is authentic or not, if you agree to limit authenticity to the contents of the four canonical gospels: they're not very long, they've been studied and indexed exhaustively, and it's easy enough to look up a saying you're not sure about to see if it can be found in them. The same is true for the Buddhist scriptures, though there are more of them. But where much is at stake -- the national or world economy, international conflicts that could turn into war, etc. -- it's harder to know whom to trust For one thing, the credentialed authorities disagree with each other. As with the variety of religions in the world, they can't all be true; how can you know whose claims to believe? For another, they often lie, and it's difficult for us ordinary schmucks to know when they're lying. These are problems that, like the poor, have always been with us and probably always will. It's not because of the Internet that we don't know what to do about them. I'd say, however, that anyone who blames the Internet for our difficulty in knowing what is true is probably not to be trusted. I just finished reading an intriguing little book, Revelation of the Magi: The Lost Tale of the Wise Men's Journey to Bethlehem (HarperOne, 2010), a translation by Brent Landau of an old story that apparently had never been translated into English before. The eighth-century Syriac manuscript Landau worked from has been in the Vatican library since the eighteenth century, but few scholars had paid any attention to it. Landau's book came to my attention when it was offered at a sharp discount on Amazon; I checked out a print copy from the public library and when I found it worth my two bucks, I ordered a digital copy. Briefly, Landau thinks that the Revelation of the Magi was probably written in the late second or perhaps the third century. The Magi, of course, are mentioned in the gospel of Matthew: the word is often translated as "wise men." When Jesus was born they came first to King Herod, asking for the whereabouts of the newborn "King of the Jews." They had seen a new star in the heavens, which had led them to Judea. Herod's experts said that the prophets had foretold that such a person would be born in Bethlehem; Herod gave the Magi this information, and asked them to let him know when they'd found the child. The star they'd seen led them to the very house where Jesus and his parents were staying, and they "offered him gifts of gold, frankincense, and myrrh." 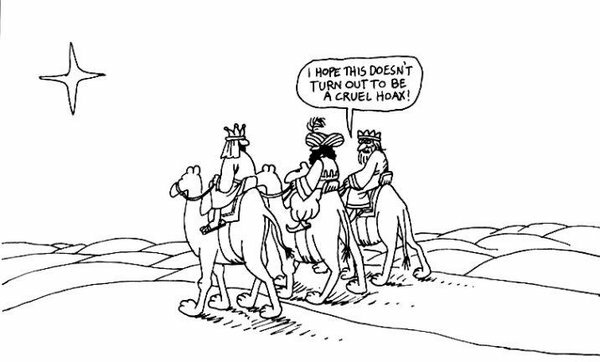 A dream warned the Magi not to report back to Herod, so they returned directly to their own country. The Revelation of the Magi invents a backstory for the wise visitors. Instead of the Persian astrologers / magicians / sages they were usually thought to be, the Revelation's Magi are from the distant land of Shir, by an unnamed ocean. According to the text, their name meant that "in silence, without a sound, they praised the God of all" (page 36). They were descendants of Adam's son Seth, custodians of books of prophecy and wisdom that he had bequeathed to them, as well as of treasures that they were to give to the Messiah when the star finally appeared to them and led them to him. (Personally, I find this detail the most interesting one in the book: the gold, frankincense, and myrrh brought by the Magi are said to have been assembled by Seth and kept in storage for thousands of years, just so that they could be brought to the baby Jesus. Why? It obviously seemed important and reasonable to the author, but it makes no sense at all to me.) When that day arrived, they had a vision of the star, which appeared to them as a child with a cross, who gave them instructions and led them to Judea. They found that their provisions were miraculously restored, that mountains and other obstacles were leveled to let them pass, so that the journey passed quickly and easily. Years after they returned to Shir, Jesus' disciple Thomas visited them, baptized them and their people, and bade them bring the gospel to their whole land. This edition is intended for a general audience. (Someday I may take a look at the scholarly version, his dissertation, which is available online.) Landau does a fine job of giving the document a context, explaining its relation to the story of the Magi in the gospel of Matthew, and its remarkable influence on Christian imagery of the Nativity and the Wise Men. All this is interesting enough, but I must say that the Revelation itself would be a disappointment if I'd had great expectations for it. I expected it to be fan fiction filling out a fictional story, and so it was. Whatever differences from or additions to Matthew's story it contained wouldn't matter except as they revealed something about the mindset of the author. The structure of the story seems very much like today's Tolkien-inspired fantasy fiction, which often feels similarly pointless to me -- the authors create worlds for the sake of creating worlds, and then are not sure what to make happen in them. Often they hope to teach beautiful lessons about how people should live, which while usually unexceptionable are nothing new, and the imaginary backdrops don't add anything to the lessons. Luckily, the author of the Revelation had a plotline ready-made in the gospel. And when it became the first of the month, we ascended and went to the top of the mountain and stood before the mouth of the Cave of Treasures of Hidden Mysteries. And we knelt on our knees and stretched forth our hands to heaven, and we prayed and worshiped in silence, without a sound, to the Father of that heavenly majesty that is ineffable and infinite forever. On the third of the month we entered the cave up to the treasures, the treasures that were prepared as the star’s own [gifts] and for the adoration of that light that we awaited. And what we read and heard from the revelation, when we returned, descending in joy, we said to and instructed our sons, our families, and everyone who gave themselves with love to learn. -- along with quotations from Seth's instructions to their ancestors and from Adam's instructions to Seth. "For there will be from my family and my children glorious and honorable people, (the reciters) of the mysteries of the majesty. And they will find great mercy and will pray, ask, and be heard. And [text missing] of the majesty, but at the end times of that generation they will again be [rebelling,] and they will not be afraid of my foolishness and of the judgment that I have. Instead, they shall be headstrong and shall speak blasphemy unto the heavenly majesty. And they will say many things, and shall also make painted idols and graven images, and shall even serve the sun and the moon, and they shall speak words of blasphemy. And all these things that are among them from the deceits of my treacherous deceiver, because he will offer the love of his fraud and his deceit filled with poison to each of the generations that will be after me. And he will [show] and make them desire the empty praise of great riches, pride, clothes, property, fornication, boastfulness, injustice, greed, and various possessions. And he will appear to them like a lover or a friend and entice them. And again, with reveling, drunkenness, impure and defiled feasts, which are an illusion [of his] empty [apparitions,] and again, with possessions of assorted excesses, he will take hold of them with fraudulent affection, which is not virtuous, just as also to me through Eve." As usual in apocalyptic literature, an ancient authority "predicts" what the reader (or audience -- this text was probably meant to be read aloud) can see in his or her present day. Also as usual, what is predicted occurs in every generation, so that the predictions are hard to prove wrong. Not that it matters -- most people are perfectly happy to overlook falsified predictions. The New Testament contains multiple assurances that the End is near, that Jesus will return within the first Christians' lifetimes to judge the world, and so on, yet most Christians are able to overlook them, and indeed to miss them entirely. Landau believes that "whether one is a born-again Christian, a Latter-day Saint, a 'religious seeker,' or a Buddhist, the Revelation of the Magi raises challenging questions about divine revelation, religious pluralism, and the uniqueness of religions—questions that merit deep, sustained reflection." In particular he finds an endorsement of religious pluralism in the story, though I think he's overreaching there. But even if he's right, that aspect of the story had no detectable influence on Christian doctrine over the centuries. Its influence appears to have been limited to details of the representation of the Magi in Christian art: the Star of Bethlehem was often represented as the Christ Child with a Cross in the sky above the travelers, for example. The theologian and saint Thomas Aquinas also was influenced by it, according to Landau. It also influenced European invaders' understanding of the peoples they met in the New World. To me, however, this indicates that the Revelation was understood to be about Christian universalism, the doctrine that the whole world would come to worship Christ (and had unknowingly been waiting for his missionaries to arrive all along), rather than about religious pluralism, and that's probably what the story's writer meant to convey. As Stephen Colbert mockingly put it, there are infinite paths to accepting Jesus Christ as your personal savior. Any text can be and will be understood as its readers wish to understand it, and this extends far beyond an old Syriac manuscript. I'm trying to figure out what people take from the Revelation. The customer reviews of the book at Amazon are instructive. Quite a few readers take for granted that the Revelation, though apocryphal, supplies authentic information on Matthew's Magi, filling in details that he left out. "The story of the Magi, their preparation for the events that would change history, their description of the trip to Bethlehem, and their re-telling of their conversations with all involved, for me, had a feeling of truth about it," wrote one. "Fascinating unknown information on the Magi, which contributes to ancient Christian tradition," wrote another. Another, after dismissing "A lot of introductory material that was of less interest," reported that she "personally treasure this manuscript as filling in much description no more astonishing than the virgin birth of the Messiah." "I love to learn about books that have been left out of the bible to figure out what really happened," wrote another. "I would definitely recommend to anyone interested in learning about where the Magi might have come from," wrote yet another. And so on. 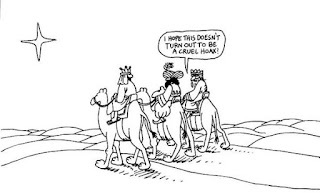 Even if you insist that Matthew's Nativity story has some basis in fact, there's no reason to suppose that the Revelation adds any factual information to it. The Revelation of the Magi is a fictional expansion of a fictional story -- fan fiction, in short. Yet many people jump to the conclusion that because it's not in the Bible, it is the truth, long forgotten or (better) suppressed by the Church. (That the story influenced orthodox conceptions of the Magi and the Star of Bethlehem for over a thousand years shows that it wasn't suppressed, by the way.) We can see the same thought process at work today, in readers' objections to the revelation that Dumbledore was gay. Even though this information was handed down by the Creator herself, many readers (including gay ones, to my amazement) rejected it in favor of their own fantasies and prejudices. Other readers proved to their own satisfaction that Rowling was wrong in pairing Harry Potter with Ginny Weasley, since Scripture itself showed that he should have married Hermione Grainger. Though they knew on some level that the Potteriad is fiction, they demanded that it conform to their wishes. It's not surprising, then, that people would take for granted that any ancient text, "apocryphal" or not, contains fact. This is how many (most?) people respond to stories they find attractive. This would be enough to baffle me, but even more, I don't get what other readers get from Revelation of the Magi. I know that stories are important tools that people use to make sense of the world, but they aren't the only ones, and since any story can be interpreted in mutually contradictory ways, no story can authorize any doctrine or principle. People ignore even the most direct commands in canonical writings, so an ambiguous passage in one non-canonical story mandates nothing. Recently I got into another dustup on Facebook when a friend posted a meme about how nice it would be if we had a story in the Bible about a "Middle Eastern" family looking for shelter, like today's refugees. I disputed the meaning of the story the meme-maker had in mind (Joseph and Mary unable to find a room at the inn), and was chastised for supposing that it had the meaning I suggested. My accuser advised me to study some theology, unaware that I've spent many years doing that. Which is unimportant; what is important is that he violated his own stricture by assuming that the story had one meaning, a meaning congenial to his political principles; the assumption of the meme was that the right story, understood rightly as any right-thinking liberal would, could settle a contemporary political question. Reading theologians will quickly show you that biblical stories can be interpreted to endorse almost any principle you like, including mutually contradictory ones. Whichever one you happen to like will conform to your "faith," and that, I've often been told, is beyond the reach of reason or even persuasion. So whatever you want to do about refugees, the Bible cannot settle it. There are plenty of good reasons to value religious pluralism, and I don't see that the Revelation adds anything to it other than the very dubious possibility that one writer may have endorsed it. I'm intrigued too when I find "modern"-seeming arguments in old writings, because people will often claim that the ancients had no such concept and couldn't possibly have seen things that way. Such examples show that in fact, the ancients could and did (and many moderns don't), but they don't settle anything, and they especially don't settle anything in religious doctrine. This is important right now, as people of all political positions wax indignant about the lies and myths their opponents accept, while credulously accepting the lies and myths spread by their own faction. I'm not going to specify which ones just now. The reader will surely be able to think of several, according to his or her own predilections and affiliations. Readers' reactions to the Revelation of the Magi indicate that the problem is much more general than religion or politics. The photo comes from a not-bad article in the Washington Post. 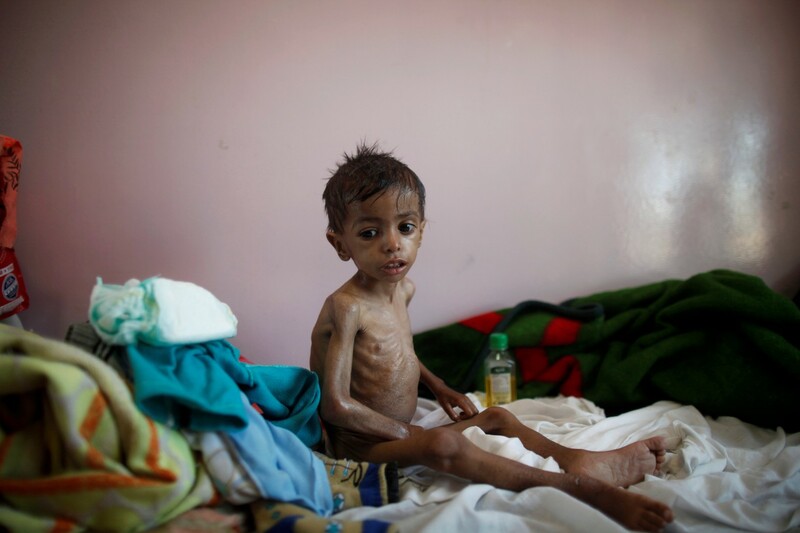 It's not-bad because it focuses closely on the suffering of Yemeni families; not-good because it reduces US complicity in the atrocities to a passing reference to "airstrikes by a Saudi-led coalition helped by the United States" - blink and you'll miss it. But I don't mean to give POTUS (genuflect) all the credit. I must also remember the US Congress, which has let numerous Presidents do these things and has been notably submissive to Obama; the corporate media, who've done their best to ignore these atrocities (they have plenty of practice! ); and the millions of liberals whose well-disciplined memories ensure that they will simply refuse to acknowledge what their President is doing. Thanks to you all for your service.